I don't have any photos of when the sign for Crossroads Plaza was new, in 1986, but I'm guessing that it made as little impression on people going by then as it does today. My interest in architecture often causes me to see things that most people never look at. I've talked about this all of my life, and usually I'll just get a puzzled look. Because I can see Crossroads Plaza, which is just across from Brittany Square, and Peoria Station. And those signs, which have been there since the 1980s, are still up, still very large, and mean absolutely nothing to most people. 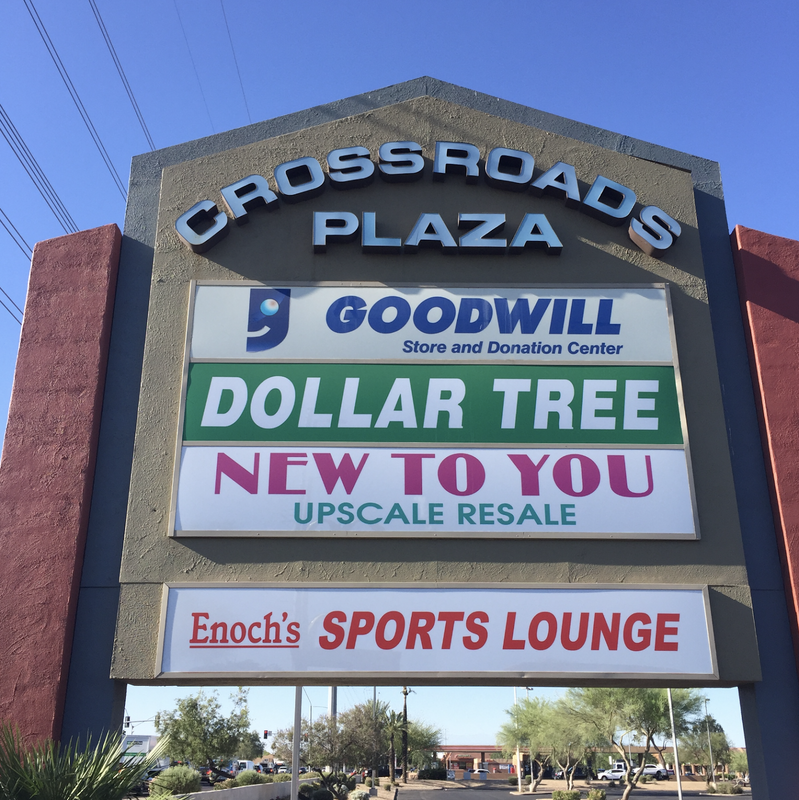 If you see the same things that I see, you know that Crossroads Plaza is in Peoria, and Brittany Square, right across the street, is in Glendale. In fact, the center of 67th Avenue there is the dividing line between the two cities. I've lived in Glendale for a long time, and I will often see the Glendale police cars turn back into Glendale (east on Peoria Avenue) and the Peoria police cars turn west. Of course, in the event of an emergency they cooperate, and are well-respected for it, but otherwise they stay in their own cities. For the last couple of months I've been meeting a friend of mine over at Crossroads Plaza, and have breakfast at the McDonald's, which is in their parking lot. As of this writing, that sign has been there for over thirty years, and I'd be willing to make a bet that most of the people who've driven past it have never seen it. The font, by the way, is Microgramma Bold, also called Eurostyle, which was very popular in the 1960s and '70s, but seems an odd choice for the mid-1980s. Thank you for visiting Crossroads Plaza with me today!